Discover all that downtown has to offer at the convenient, comfortable Holiday Inn NYC / Lower East Side. You are at the heart of everything; shopping, dining, entertainment and the arts. You are within walking distance of the Tenement Museum, Katz Delicatessen, Chinatown, Little Italy and Soho. When getting there has to be fast and convenient, we are only 9 Miles from LaGuardia Airport, so you' will spend less time in traffic and more time doing what you came to New York City to do. We are at the foot of the Williamsburg Bridge with easy access to Brooklyn and offer easy access to the Brooklyn-Queens Expressway. Whether you are coming to New York City for business or just for fun, your room at the Holiday Inn NYC / Lower East Side is your personal retreat. You will have room to work, relax and make the most of your day. Amenities such as high-speed Internet, a work center, plush towels and luxurious bedding mean every night is a great night and every day starts right. You can enjoy a great meal or a cold beverage in our restaurant, Retro Bar & Grill. 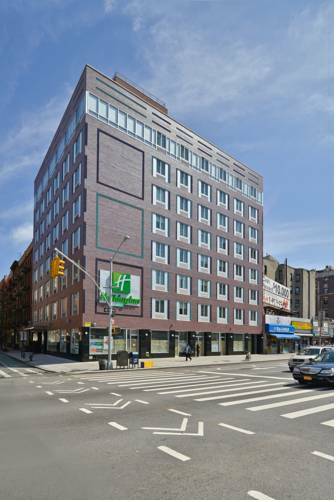 The best of New York City is waiting for you at the Holiday Inn NYC / Lower East Side! Retro Bar and Grill restaurant serves breakfast and dinner. Hours of operation are 6:30am to 11am and reopens again at 5pm to 11pm Monday through Saturday. On Sundays, the restaurant closes at 10pm. Retro Bar & Grill is a 50's style diner-themed family restaurant and bar area with some uniquely brewed beers and fantastic twists on classic meals. All at a reasonable price. 300 square feet of meeting space with tables and chairs. Office supplies available. Century 21 Department Store offers designer women's, men's and kids clothing, accessories, shoes, home goods and gifts at up to 65% off retail.